Our Lobbyist, Mark Molloy, shares the the latest news regarding the new state requirement to provide sick leave for part-time, full-time, per diem and seasonal employees in the state of Massachusetts. This law is in effect as of July 1, 2015 and we've put together a very comprehensive analysis as to how this may or may not effect your massage therapy practice. We will continue to update you with law and legislation changes as our Government and External Affairs program is hard at work to make sure your voice and rights are protected. Make sure you continue to see this type of information that directly impacts your livelihood by signing up for our AMTA-MA Chapter emails. Sign up here today. Massachusetts law previously did not require earned sick leave to be provided to employees. The earned sick time law, M.G.L. c. 149 § 148C, was approved by the voters on November 4, 2014 through a ballot question. (Question 4). The new law, which entitles employees in Massachusetts to earn and use sick time according to certain conditions, goes into effect July 1, 2015. Under the new law, employers with eleven (11) or more employees must provide earned paid sick leave. Employers with ten (10) or less employees may provide unpaid sick leave. An employee can use earned sick time if required to miss work in order to: (1) care for a physical or mental illness, injury or medical condition affecting the employee or the employee’s child, spouse, parent, or parent of a spouse; (2) attend routine medical appointments of the employee or the employee’s child, spouse, parent, or parent of a spouse; or (3) address the effects of domestic violence on the employee or the employee’s dependent child. Employees will earn one hour of sick time for every 30 hours worked, and begin accruing those hours on the date of hire or on July 1, 2015, whichever is later. Employees can begin to use earned sick time on the 90th day after hire. Employees can carry over up to 40 hours of unused sick time to the next calendar year, but cannot use more than 40 hours in a calendar year. Employers do not have to pay employees for unused sick time at the end of their employment. If an employee misses work for a reason eligible for earned sick time, but agrees with the employer to work the same number of hours or shifts in the same or next pay period, the employee will not have to use earned sick time for the missed time, and the employer will not have to pay for that missed time. Employers are prohibited from requiring an employee to work additional hours to make up for missed time, or to find a replacement employee. Employers may require certification (i.e. written documentation from a health care provider, etc.) of the need for sick time if an employee uses sick time for more than 24 consecutively scheduled work hours. Employers cannot delay the taking of or payment for earned sick time because they have not received the certification. Employees must make a good faith effort to notify an employer in advance if the need for earned sick time is foreseeable. Employers are prohibited from interfering with or retaliating based on an employee’s exercise of earned sick time rights, and from retaliating based on an employee’s support of another employee’s exercise of such rights. What do you need to do if this applies to you? 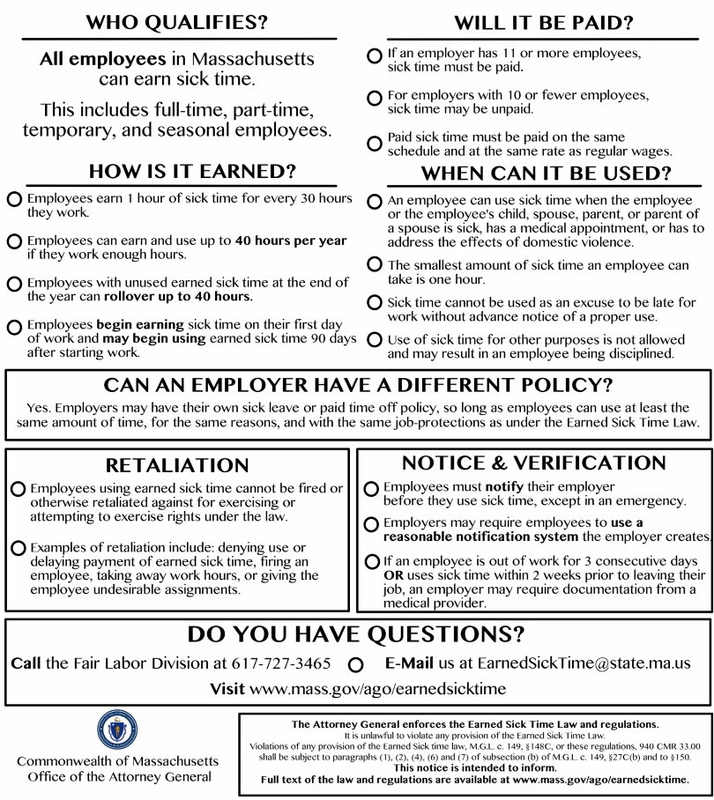 Please visit the Attorney General’s website to learn more about the earned sick leave law: http://www.mass.gov/ago/doing-business-in-massachusetts/labor-laws-and-public-construction/earned-sick-time/. The Attorney General’s website contains information about the new law and regulations issued by the Attorney general governing the implementation of the new law. The Attorney General is charged, under the law with enforcing its provisions.